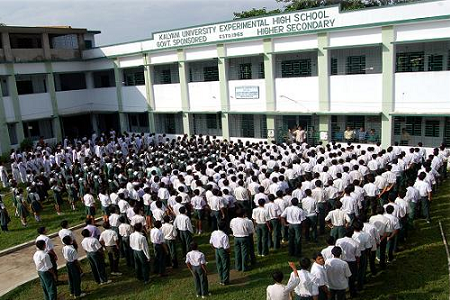 Kalyani University Experimental High School started her journey in 1965 as an English medium K.G. school housed in two sheds and eight L.I.G. quarters. The school was a dream project of the University of Kalyani because at that time there was dearth of schools especially English Medium one at kalyani to provide wards of the employees of the University of Kalyani with standard education as well as for the trainee teachers of Kalyani B.T. College . We know that our duty is not limited in imparting education in classrooms. 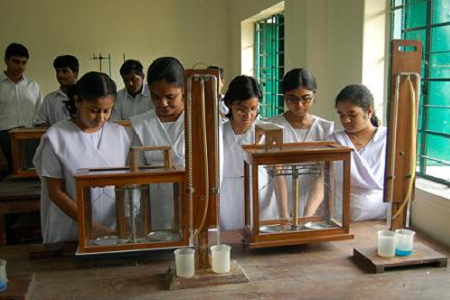 We want to beyond prescribed syllabus to break the monotony of the students. Our pupils have ample of scope to play different indoor and outdoor games. 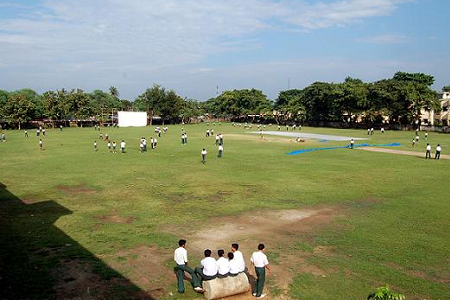 We have a well-maintained cricket pitch, a volleyball court adjacent to the school building. Every year inter class Football tournament is held and pupils can show their skill, stamina through this. We are indebted to Kalyani Municipality and Kalyani Stadium Committee for their pain staking effort to make this lush green field surrounded with Teak, Mahoginy and other trees. Computer literacy is a must now a day therefore we give much emphasis on computer training. We have 26 computers and 3 qualified teachers under the guidance of Dr. Amarendranath Chatterjee for imparting computer training to pupils from class V to XII. 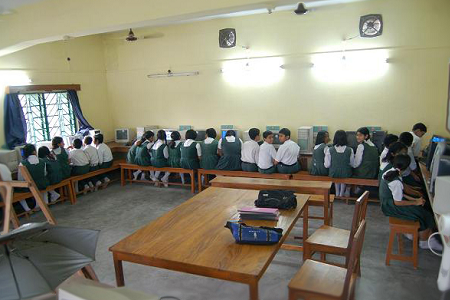 Computer education is compulsory up to class VIII. The faculties under the able guidance of Dr. Chatterjee helped in publication of the Bengali and English version computer textbook for class V to VIII which also given to pupils free of cost. We firmly believe that only classroom teaching is not enough for the cognitive development of a student. It is our duty to inculpate moral or ethical values among students. Besides we are conscious about their physical as well as mental development. Now efforts are in to make an auditorium hall where students can stage various cultural programmes. Again we are keen to arrange quiz competition, extempore lecture on regular basis to keep our pupil abreast with the current affairs. Students health club will be our future step. In course time the K.G. school has grown into a full-fledged H.S. School. In 1970 the W.B.B.S.E. recognized the institution as XI class High School with two streams viz. Science & Humanities. From 1965 to 1986 the school had been under the University of Kalyani. Later in 1987 the Govt. of W.B. had been taken over all the fiscal liabilities and the school had become a Govt. Sponsored one. In 1990 the W.B.C.H.S.E. recognized the institution as an H.S. School. In the last five decades the school has occupied a position of excellence in the state. Many of our students enhance the glory of the school by scoring brilliant result in the M.P. and the H.S. exam and securing good position in the J.E.E. and I.I.T. However the school is now housed in a stately fielding comprising airy and cozy class rooms, well equipped laboratories, indoor sports room, computer laboratory and a nice library with a reading room. Besides, we have a flock of young, talented and dedicated teachers who render their tireless effort to retain the golden legacy of the school. So having crossed many hurdles the school is heading forward with a vision of a brighter tomorrow. An additional English version section from class V to XII has been introduced and in near future the will have both Bengali and English medium simultaneously run in secondary and + 2 level. The response of the guardians and some retired teachers to this venture is quite positive. We are keen to arrange 'Parents-Teacher' meeting on regular basis for the excellence of the school activity. Hope the valued suggestion from all corners will help the school surge ahead. Some bolder step for the betterment of the institution will be taken near in future. K.U.E.H.S. Students can now register in Alumni Association of School. Students you can create account and participate in forum discussions. Registered members of kuehs.com can use the eMail Client feature to send emails to any members of this association. Members can upload 1 profile picture for their accounts. Currently the picture file size that you are uploading should be less than or equal to 50 KB (KiloBytes) . Utilize school forum to discuss, add new ideas to development and interact with school authority.